This book is from the editors of Health magazine, to which I subscribe. It's heavily featured in just about every issue so I wanted to see what it was all about. I picked up a copy a the library. It's a very fast read. The title is misleading and the messages are mixed. 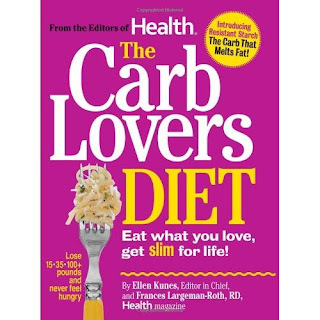 The study they quote in the first chapter states that the slimmest people ate the most carbs (oooooh!) In the form of whole grains, vegetables and fruit (awwwwww!) That's a pretty big caveat for a booked titled "The Carb Lovers Diet" especially when it's released in a country where many people are addicted to carb-laden, processed convenience foods. But as I read further, it seems that the book is aimed at people who have been programmed to fear carbs since the Atkin's craze. The kick start plan is just 1200 calories a day, which I find extremely restrictive, especially during the transition to a healthier way of life when small steps, not drastic changes are much more effective in the long run. Not much new information here; eat more "good carbs" from vegetables, fruit and whole grains. The information on resistant starches seems fairly gimmicky. I don't think it will come as a surprise to anyone that a slightly under ripe banana makes a filling snack, especially when paired with a slice of whole grain toast and schmear of nut butter. There is a whole section on working out, which is often lacking in many diet books, so that's a plus. There is also emphasis on portion control, which is especially important when eating carbs such as pasta and rice and any plan that encourages eating plenty of fruits and vegetables can't be all bad. The recipes seem very easy, but awfully high in sodium and they rely heavily on "grab and go" foods, which when trending toward healthier options are best left as a last resort. If you're truly interested in reading The Carb Lovers Diet, do like I did, hit your local library and save your money. Those kind of gimmicky books annoy me a little. Good sound advice, but packaged to sell for those that think they won't have to change anything. I may see if my library has this, just for fun. I like to read all the books out there (or skim them at any rate). I borrowed this from our library a little while back, and was so happy I didn't buy it. I found it less informative and helpful than an older book I already own, "The Carbohydrate Addict's Diet," which I've sort of adapted in part to my own lifestyle. I don't eschew carbs altogether, I just try to choose better ones to enjoy. Common sense, actually.